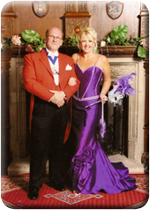 The Masonic Ladies Festival is a wonderful evening or part of a weekend away which should be a time of celebration for the Master and his Lady and their Guests. The success of your evening depends upon its careful planning. This is where Philip Gardner is here to help! Philip has the experience to ensure that everything goes according to plan and you can be rest assured that he will carry out his role in line with vital etiquette and traditions. Click here to contact Philip Gardner today to discuss your requirements for your Masonic Ladies Festival.